Today, Lilly and I are happy to welcome Guest Blogger Rod Burkert from GoPetFriendly.com, which has both an incredible site for info on traveling with your dogs (including a trip planner) and a terrific blog with loads of updates on their non-stop, on-the-road adventures. This recent post featuring the dogs with a bunch of statues of famous people cracked me up. Rod and his wife Amy travel pretty much FULL TIME with their two (somewhat fearful) dogs — Buster and Ty. The idea of constantly being in new places and doing new things, with TWO fearful dogs in tow, impresses and astounds me. SO, I asked a few questions to find out exactly HOW they manage it. Tell us about your fearful dog (ages, breeds, how fears manifest). 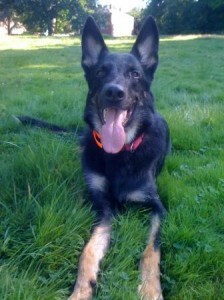 Buster is a 3-year-old, 75-pound German Shepherd who we found abandoned in our Philadelphia neighborhood. He literally showed up on our doorstep, and we took him into our home. It’s likely Buster was not properly socialized as a pup because his issues arise around other dogs, large or small, when he is on leash. Most times when we approach another dog Buster’s hackles go up and he growls; sometimes he barks. Occasionally, he’ll really get into it with loud barking and jumping up and down. Off leash (like at a dog park), Buster is a little aloof, preferring to explore the scents around the perimeter, but once that’s done he plays nicely in the sandbox with other dogs. 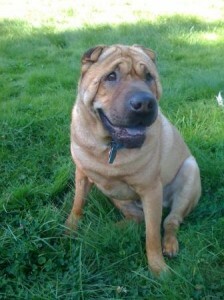 Ty is a 5 ½-year-old Chinese Shar-Pei. At just 35 pounds, he’s small for a male of this breed. We got Ty when he was 8 weeks old from a wonderful, reputable breeder who we still stay in touch with via email and on Facebook. Generally, Ty does not take well to strangers. He prefers to tentatively sniff and does not relish being touched. This fear is more pronounced with men than women. If someone bends over to pet him, Ty gets startled and will back away and bark. Also, Ty has fear/aggression issues with other dogs – on or off leash. When Ty sees another dog, especially in close proximity, he gets fixated. You can talk to him, touch him, even offer a treat, but you can’t get his attention. Amy believes Ty’s fearful behavior resulted from an attack by a much larger Gordon Setter when he was six months old. Our problem is compounded by the fact that the dogs behave differently depending on who is walking them. For example, I walked Buster and Ty this morning because Amy had a conference call. We walked by several dogs with only a few snags as they respond better to my “Leave it” command. Amy has less success if she is walking the dogs alone. And, interestingly, we have the least success when we walk them together – which is most of the time! As you can see, our dogs are not exactly the “poster pups” you would expect for people who run a business called GoPetFriendly! How on earth do you travel full-time with a fearful dog? What coping strategies do you keep in place? First let me say that our dogs have pretty specific fears. For Buster, it’s dogs; for Ty it’s dogs and strangers. Unlike other dogs that may have many environmental sensitivities, our dogs’ triggers are much more easily anticipated and managed. Of course, now that we travel pretty much full-time, we meet a lot of strangers and their pets. And since GoPetFriendly is all about visiting pet friendly places, we rarely leave the boys behind. We approach every day as a new opportunity for Buster and Ty. To manage our new lifestyle, we practice several coping strategies. First, Amy and I are a great team. If one of us is having a bad day and gets frustrated by the boys’ behavior, the other steps in so that no one loses their temper with the dogs. Second, we make sure both dogs get plenty of exercise – and I generally walk Buster, as he seems to respond better to other dogs when he is with me. While we’re out and about we also try to keep as much distance as possible between Ty and other dogs. Amy is likely to cross a street when she sees another dog coming, and I can’t say that I blame her since she often has to pick Ty up and carry him when he gets too freaked out. Finally, we got Ty a dog vest emblazoned with “Please Don’t Pet Me – I’m Working” patches. It has worked wonders!! Now we rarely have to rebuff a stranger’s untoward advance. People see the vest and assume he’s a service or therapy dog and steer clear. Or, if people do get closer they read the patches and keep their distance, which allows Ty to stay in his comfort bubble. Since we got the vest, we’ve seen him getting more curious and confident around new people – even putting his paws up on a woman’s thigh to sniff the treats in her fanny pack! What’s the funniest or worst thing that’s happened on the road with your fearful dog? I guess we’ve grown so accustomed to Buster and Ty’s behavior that we don’t think of it as traveling with fearful dogs, just our dogs. That said, the worst thing that happened was Ty being attacked by a small “yippee” dog that had escaped from its house when it saw us walking by. The dog charged Ty and bit him on the ear, drawing blood. We were devastated because we felt like we’d been making good progress in modifying Ty’s behavior. (It also showed us that no matter how bad we think our dogs are, there’s always someone whose dog is even worse!) Fortunately, Ty bounced back pretty quickly and we’re continuing to see positive changes. 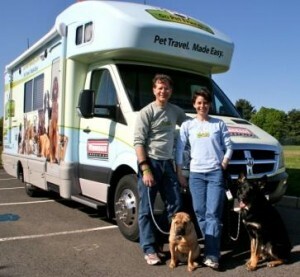 Rod, Amy, Ty & Buster travel the U.S. in their GoPetFriendly.com RV. The funniest thing? Okay … we’re crossing the border from Canada back into the U.S. Needless to say our GoPetFriendly-wrapped RV attracts a lot of attention. Normally, this is a good thing. But with border guards – not so much. It must have been a slow day. The guard asks 20 questions and then politely says: “Pull ahead and step out of the vehicle.” We comply. Meanwhile, another guard comes over to keep us company. She was trying to make light conversation, but I think you can do that without your hand on your holstered Glock. The first guard proceeds to walk through the RV, front to back and back to front. Opening the cabinet doors, the fridge, checking under the seats. Meanwhile, Buster and Ty are barking like banshees. “There’s an interloper!” “In the RV!.” “He’s touching our stuff!” “I think he stepped on my bed!” Yesiree, Bob. We are GoPetFriendly.com – look us up on the Internet! What advice would you give to others who want to travel more with their fearful dogs? I suspect many people have dogs with issues similar to Ty and Buster’s, are worried about traveling with them and, therefore, won’t take their dogs anywhere. You can’t succeed if you don’t try. Take small steps, and don’t push too far too fast. Look at each challenge as an opportunity to train your dog. And don’t worry about what other people think about your dog’s behavior. If your dog is really out of control, you need to work with a trainer before you travel with her. Just don’t give up. Also recognize that your personality may be affecting your dog’s behavior, that is, it may not be the dog, it may be YOU. I recognize … I know that I need “training” as much, if not more, than our dogs. I went 44 years without owning a pet; it’s only been in the last 10 years that I am “with dog.” Amy and I know the better behavior we are seeing in Buster and Ty is partly the result of our own behavior modification. Our fearful dogs are teaching us! Great post. Rod, I didn’t know you have only been with dogs for 10 years. You seem like a natural. It’s also great that you and Amy take turns handling the boys when a bad mood arises. Peggy … Interestingly, the one thing I don’t do is cross a street when I see another dog coming the other direction. First, Buster and Ty don’t react to every dog. So I’m trying to observe what’s going on. Is it the size or color of the dog? Are the dogs sensing some of my dread? Second, I am always hoping that the “next” encounter will be the one where nothing happens and that the fear will be gone. If I cross the street, I am not giving myself or the dogs a chance to perform up to our abilities. Kenzo … I am enjoying running into you in blog comments! One thing I am learning is how screwed up I am! With Buster especially, I got the dog I needed and he is definitely helping me become a better person (Amy will confirm that!). Edie … thanks for your comment. In the beginning, Amy and I were really concerned that someone would “find us out” because our dogs aren’t well behaved. Since then, we’ve shared a few blog posts and people have really resonated with our “situation.” I feel better, Amy feels better, and the dogs aren’t as stressed because they’re not feeling our stress. Great questions Roxanne. And great answers, too. We have a similar issue, my dog Kelly tends to pick a fight with other dogs (although I”m sure they started it!). This makes walking stressful. I am always on the alert and like Amy, I will cross the street to avoid passing other dogs. Sometimes, however, they follow us. Kudos to you guys that it is also about training yourself, not only about training the dog. Being a first time dog owner myself, I can really relate to your story. Keep travelling and sharing your stories! Great post! Bottom line: Our dogs would rather be with us than without us (and vice versa) so it’s terrific that you’re taking the time to work with them on this issue. It’s also great that you’re being honest about the problems you’re having. It makes others realize that there are no poster dogs for travel, only some that do better than others — some of the time. The more people learn not to expect perfect behavior, the less frustrated they’ll be, and the more fun they’ll have. Rae … yes, on one hand it is a matter of planning ahead and trying to avoid the triggers that set our dogs off. On the other hand, it’s tough to avoid people and pets when we’re supposed to be GoPetFriendly! Based on your comment, how much do you travel with your dogs? Are you still doing it? The reason I ask is that we recently started a blog post series about people who travel a lot with their pets. Our hope is that the stories will inspire our readers to do something cool with their pets. Are you interested? Hey Maggie … hope those #endBSL postcards are still flowing in. As far as who is teaching who, Amy and I aren’t sure who is more of a work in progress – us or Ty and Buster! The frustrating thing is that the dogs behave better for me than they do for Amy – but we like walking the dogs together. Thanks Debbie … we’ll keep the travel up as long as we can. Just so much to see … it truly is a great country. We’ve been in South Dakota – a truly amazing state with the Badlands, the Black Hills, and the prairie country in between. One of dream lives! Hope you’re enjoying it as much I think I would. Fabulous that you ‘went for it!’. Great post, Rod! Love the helpful tips – I struggle with a lot of the same things with Lucas. But my biggest takeaway is your last line: Our fearful dogs are teaching us! I travel with two fearful dogs. For seven and a half years now! My dogs are completely different when away from home. Off their turf, they are less reactive and are fantastic travel companions. One dog is globally fearful so I have to plan with care to not put him in to too scary situations, sometimes planning exits from the car at night in busier city atmospheres, etc. They do find some of the new places fun and overall they are so glad to just be with my husband and I. The stops we make at places they’ve been to before, are recognized and if it is a fun- to them- place, they get excited before the car stops. It’s amazing how adaptable they really are- as long as I’m there or our stuff is there- they know we will come back 😉 plus, I’m better if they’re with me too!